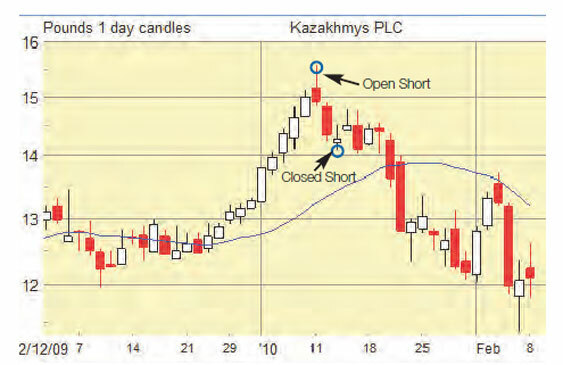 A trade that we took in 2009 was a short CFD in Kazakhmys (KAZ.L). 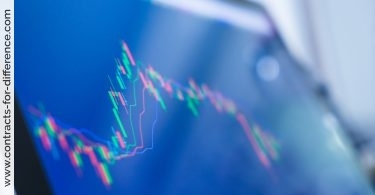 With the shares having risen consistently for 11 straight sessions, momentum had begun to look incredibly overbought and in need of a correction. 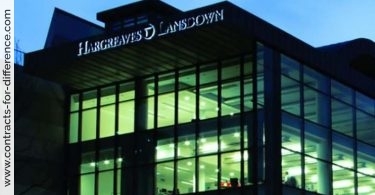 The shares had gapped higher from 1511p at the open and surged in early trading. We were mindful of the old technical adage that ‘gaps close’, and felt that this may have been an exhaustion move which can often be seen at the end of a strong run. We opened the short position at 1557p on 11th January with a target of 1345p and a stop loss placed at 1635p. Almost immediately the shares began to correct lower. By the end of the trading session the gap at 1511p had been closed, a bearish move. With a weak open on the next morning the shares fell to 1470p in the early minutes. We quickly moved to protect the position by moving the stop-loss down to 1542p. Throughout the day the shares continued to decline and again moved the stop lower, this time to 1475p, which would give just over 5% profit. The shares opened the next day lower again, falling to 1410p, however we noticed that the volume on the buy side of the order book outnumber the sell side by a factor of around 3 to 1. This suggested that support was beginning to build, so we decided to to lock in a 9.4% profit on the trade and close the position at 1411p. Although the shares actually fell over the next couple of weeks to a low of 1206p, a short term jump above 1475p would have triggered the stop before further decline was seen. Let’s assume an investor was prepared to risk £250 on the trade. The following scenario would have been played out. By entering the trade at 1557p and having the initial stop loss at 1635p the percentage risk was about 5% excluding commissions. Risking £250, equated to a trade size (contract value) of £5,000. This was calculated by dividing the £250 by 5%. This means that the investor sold 322 contracts at 1557p (5000/15.57). With the trade moving in our favour, we moved the stop-loss down to 1542p, which was at the entry level including costs. Therefore if the trade was stopped out at 1542p, there would have been no net loss on the trade. We finally closed the trade at 1411p and locked in a profit of £470. 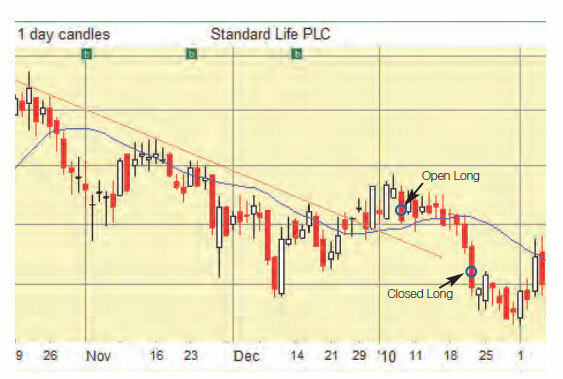 Another trade involved a long CFD in Standard Life (SL..L). We had noticed that a ten week downtrend had broken, the 20 day moving average had turned higher, momentum was improving and the shares looked set to continue the recovery. A long position was opened at 212.2p with a target of 237p which had been the October high. In order to guard against significant losses if the trade turned against us we advised to place a stop loss at 202p. Unfortunately the market started to decline in the second week of January. Despite the shares holding up well for the first few days, support at 207p finally gave way on the 20th January, and the shares fell sharply. The stop loss was finally triggered on 21st January at 202p. This meant a loss of 4.8%, however considering the price fell to below 194p, over 8.5%, the losses were fortunately limited. Assuming the investor was again prepared to risk £50 on the trade and by entering the trade at 212.2p with a stop-loss placed 202p the percentage risk was 4.8% excluding dealing commissions. Risking £250, this equated to a trade size (contract value) of £5208. This meant that the investor bought 2454 contracts at 212.2p. Unfortunately the trade moved the wrong way and eventually the investor was stopped out at 202p for a £250 loss.